I know it's spring now, but it just couldn't wait for winter to put this article on the blog :). 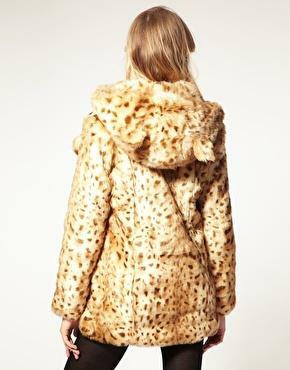 I bought this furry coat on Asos at a 50% discount! Getting it wasn't that easy though.. When I saw this coat I immediatly decided to buy it. I had already put it in my 'online shopping cart' and was still looking around on Asos looking for other stuff. As I tried to pay the jacket it was sold out :(. I guess someone had been faster than me and bought the last one. Dissapointed as I was I sent a mail to Asos but they said the jacket was no longer available. I kept on looking and a few days later it was back on Asos :)! I guess someone had sent it back :)! Lucky me! The coat is really warm and soft :) and don't you just love the ears?